It has been on my list to visit the Miami Circle space of Summer Loftin Antiques & Chovan Designs ever since their opening back in the Fall. I stopped in yesterday with my sights set on checking out the block print pillows they have featured from Athens, GA based company Block and Brayer. I was turned onto Block and Brayer by Atlanta interior designer Allison Harper who has collaborated with the company on the current designs. In addition to the linen pillows (my photos below & nestled on some lovely period pieces), Block and Brayer also offers hand block print designs in scarves, makeup bags, dog beds, and fabric by the yard, available through Allison Harper. 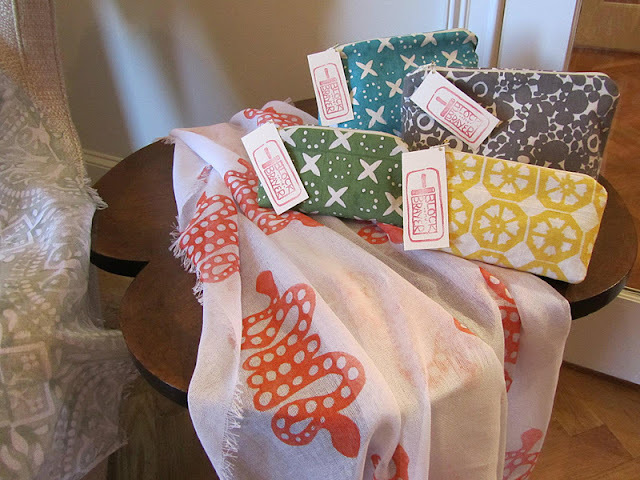 An assortment of scarves and makeup bag designs are available through Allison Harper.